Games don’t tend to age as well as entertainment from other media. A movie made 60 years ago, even if it’s not a particularly well-made movie, can be just as enjoyable today as it was when it first hit theaters. There are many video games from my childhood in the '80s and early '90s that I absolutely loved, but can’t push myself to play today because issues I could ignore or missed as an adolescent today stand out like a sore thumb. The Legend of Zelda is not one of those games. When it was released it changed gaming, and when I finally got to play it at five years old, it changed me and started a lifelong love affair with interactive entertainment. So well crafted, so forward thinking, the NES masterpiece is just as playable today, 30 years later, as it was when it was first released. Something tells me 30 years from now, when I’m 61, I’ll be saying the same thing about The Legend of Zelda: Breath of the Wild. 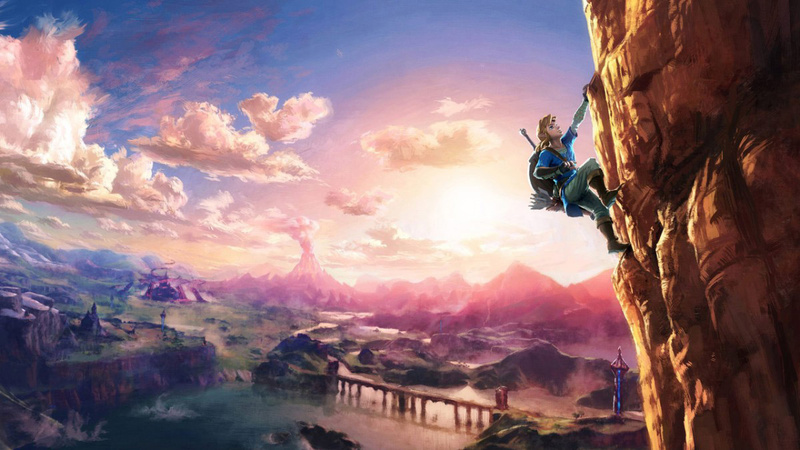 To judge The Legend of Zelda: The Breath of the Wild solely against previous entries would be a disservice to the entire series. The classic Zelda formula still works when it isn’t bogged down by inane tasks. Breath of the Wild’s go where you want to go, do what you want to do conceit isn’t any better or worse, it’s just different. If A Link Between Worlds was a chance to eliminate the staler elements that permeated Skyward Sword, this game is a palate cleanser for the whole franchise. The story here is the same as it’s ever been: a boy with his sword challenges a demon that just won’t die with the help of a princess imbued with the blood of a goddess. 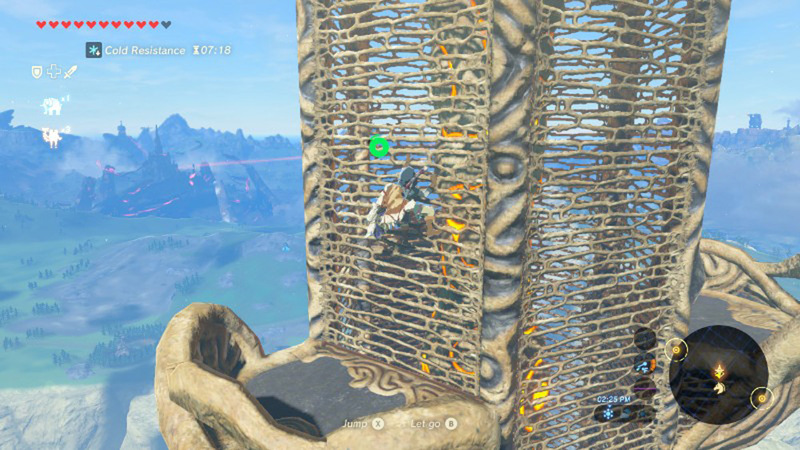 In Breath, Zelda and the Calamity Ganon have been trapped in a 100-year battle at Hyrule Castle. The surrounding towns and villages were destroyed, their charred remnants scattered across the land as reminders of what has been lost. Link, gravely wounded in the fight, was taken to a restoration chamber, waking 100 years later with no memory of what transpired. Your overall goal is obviously to beat Ganon and save Zelda, but the road to the final confrontation will be paved by your actions and your decisions. 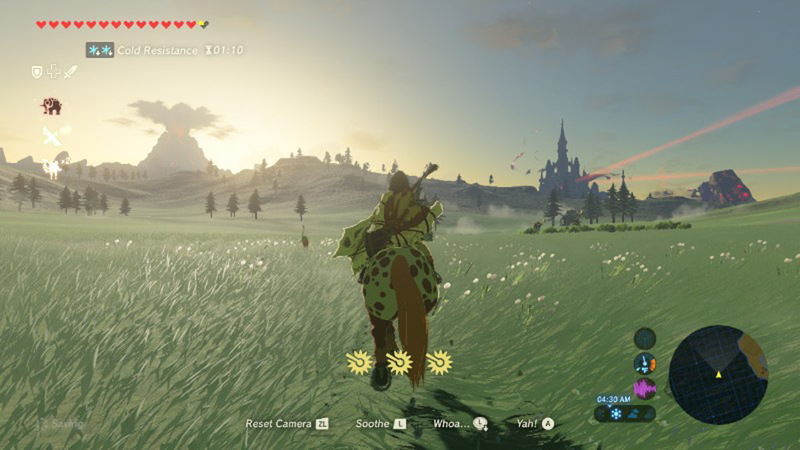 It’s quite well known at this point that Breath of the Wild features an open-world design. Spending 54 hours in it, it’s one of the most open worlds I’ve ever experienced, reminding me very much of an MMO with all the level restrictions removed. Once you finish with The Old Man at The Great Plateau, you’re free to go in any direction you want, conquering the game as you please. For me, that meant running around discovering all of the Shiekah Shrines I could. These puzzle and combat trials, built centuries ago, offered many wonderful opportunities to use the Shiekah Slate. Obviously inspired by the Wii U GamePad in the same way the Tingle Tuner was obviously a Game Boy Advance, the Shiekah Slate is as close to a classic Zelda item you’ll find here. Using it, you can take pictures, create bombs, whip up blocks of ice, manipulate metallic pieces, and freeze time on an object, allowing you to strike it repeatedly with your weapon to send it flying. 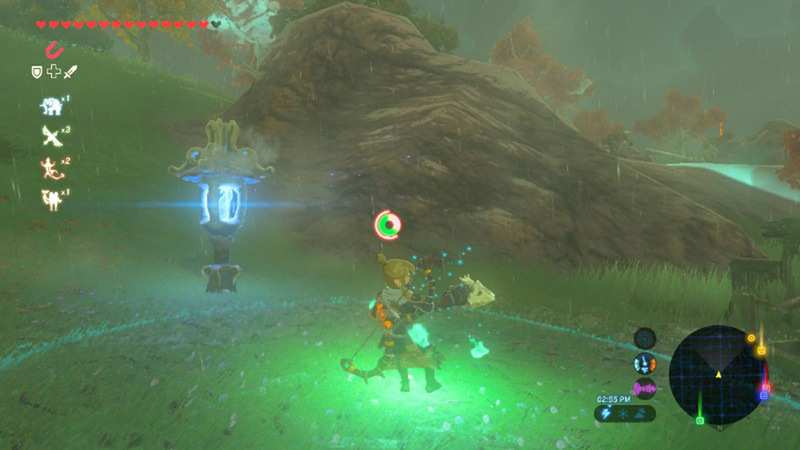 While early Shrines point to just a few options for the device in puzzle solving, the real-world applications of it proved to be quite versatile. Beyond uncovering secrets, I found many different ways to use the slate to my advantage. Ice blocks could serve as a quick bridge or shield, stopping time on a massive slab of rock let me jettison it right into an enemy encampment, and I was able to use the magnetic feature to steal weapons before the enemies could grab them. Plus bombs, which are perfect for making things go boom. The depth at which I used the Shiekah Slate is great, but I feel an even more important change in design direction is how this game isn’t setting you up to succeed. Past Zelda games, with their linear progression, have always prepared you for the fight you have ahead. You were given the right tools at the right times and the land was littered with bombs, arrows, and enough rupees to fill any size wallet. 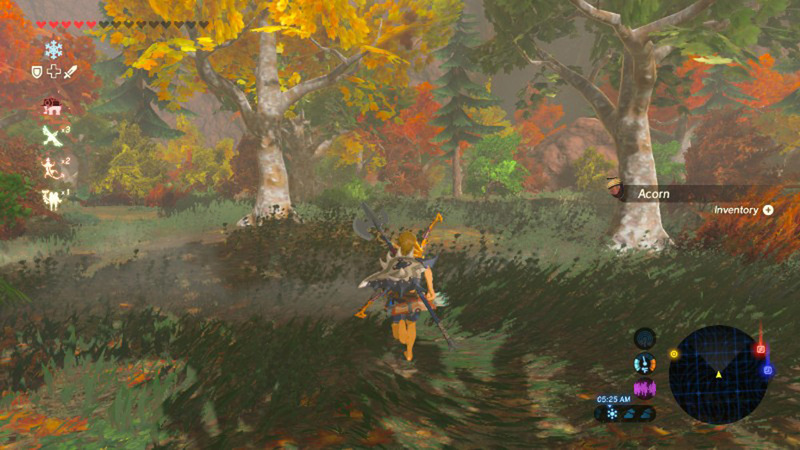 In Breath of the Wild, you’re destined to fail unless you go out of your way to find the supplies you need. Foraging for food because there are no heart pieces, stealing weapons off of enemies because yours are close to breaking, cooking up dishes because there’s no easy-access potion shop – success isn’t handed to Link, he and you have to earn it. That was a fact that took me many, many hours to figure out for myself. I spent too much playing this game as if it were every other Zelda game, even though all the signs were telling me to do otherwise. It wasn’t until I died for what felt like the 50th time fighting my second dungeon boss that I realized I had to change how I played. Like John Rambo in First Blood, I had to actively prepare for the fight to come and while a montage of me gathering fruit and cooking bugs wouldn’t pack the same punch as watching Sylvester Stallone assemble spear traps that make you wince in pain at the thought of them, that careful and time-consuming effort paid off just the same. With all that planning, I was finally able to challenge the dungeon bosses with confidence. 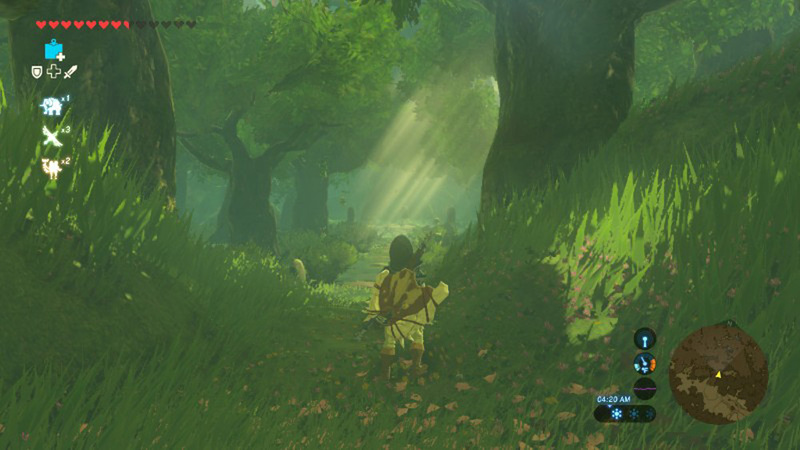 Unless there are some hidden in a remote part of Hyrule, Breath of the Wild has only a handful of dungeons. They’re almost purely puzzle-based, meaning you can conquer them in any order you like. Activating every switch in the dungeons required me to put my thinking cap on, and with a healthy amount of experimenting, I was able to unlock the keys to each one and make my way to the boss battle. With no dungeon-specific items to collect, these boss battles, one of which was aggravatingly difficult, tried my combat skills like no other. There were patterns I could follow, yes, but actually defeating them required lighting-quick reflexes, thorough competency in the controls, and extensive planning, including making sure I had enough weapons to defeat them. Weapons break and they break often. Some didn’t last a single encounter and there have been times I had to cycle through three different melee tools to defeat one enemy. I’ve been annoyed by breakable weapons in the past, but here I never reached a point where I became disgusted by the concept. Replacement weapons are easily available and, with the Shiekah Slate and stealth skills, I could easily steal swords and clubs before Bokoblins had a chance to use them on me. There’s a nice variety in the weapons too. Sword and shield combos, two-handed spears that are ideal for mounted combat, clubs of all sizes, and boomerangs that could be used as a short sword and a projectile that returns to you. The further I went in the game, the more durable weapons I came across, eventually ending up with the Master Sword. If the game were less generous with new weapons, the fragility of my armaments would have been an issue. Now, this review may sound like I’m just full of endless admiration for the game, oblivious to the issues found within, but it’s easy for me to admit it’s not without its flaws. 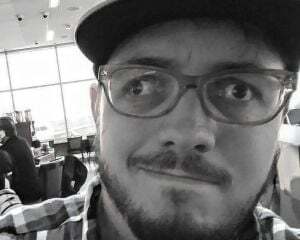 The framerate can actually stutter to a stop, inventory management could be less cumbersome, I encountered a few instances of overlapping dialog in the cutscenes, it takes an unusually long time to come out of the home menu – which might be a feature and not a bug – and it quickly became annoying to stop the action every time the Blood Moon returned my fallen foes to the world of the living. There’s also the fact that outside of off-TV play, there are no GamePad-exclusive features. I get those concerns exist, I just don’t really care. Not one of them dampened my enjoyment of this title in any way or took away from the pure joy of picking a direction and just going. The topography of Hyrule is so thoughtfully littered with points of interest, its siren song seducing me to each tower, to each shrine, to each interesting rock formation that actually turned out to be a puzzle. The sense of discovery here is like nothing I’ve felt in a long, long time. There is no other way to put this: The Legend of Zelda: Breath of the Wild is brilliant. It is magnificent. It is marvelous, amazing, fantastic, and every other synonym for the word wonderful that can be found in the thesaurus. If The Legend of Zelda was the flint that ignited the passion I have for video gaming, Breath of the Wild is the 500lb bag of charcoal that will keep that fire burning for decades to come.